For those of you looking for a cheery holiday fashion accessory, this slouchy bonnet is the answer. What it lacks in warmth (compared to my Snow Country Ski Hat), it makes up for in style and texture! It’s pleasantly slouchy, has a nice big brim, and fluffy pom-poms (because pom-poms make everything better–well almost). If you are set on using this for the ski slopes or outdoor hiking, adding a lining would make this work for those truly cold conditions. 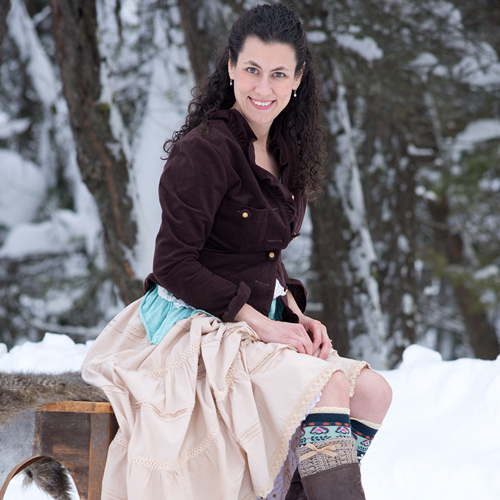 Now you can stay even warmer with the addition of the free, Cranberry Twist scarf pattern! Find it here. To work this pattern you will need to be comfortable working in the 3rd loop of an hdc stitch. -The main part of this hat is worked back and forth, like rows, but they are joined at the end with a slip stitch, before turning, and heading back the direction you just came. -Finished adult size hat should measure 9.5″ wide, by 11″ tall from bottom of brim (excluding pom-pom). 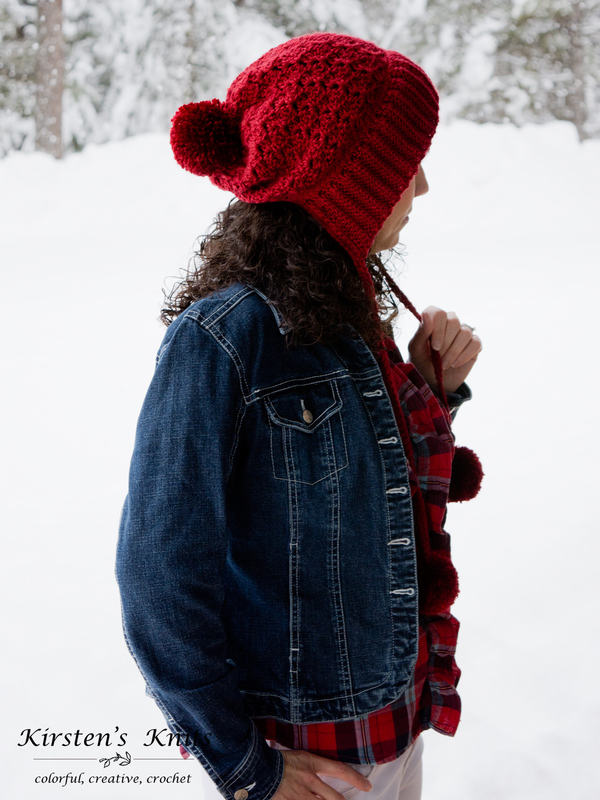 -Use loose tension when making this hat, or go up a hook size if your measurements are off. 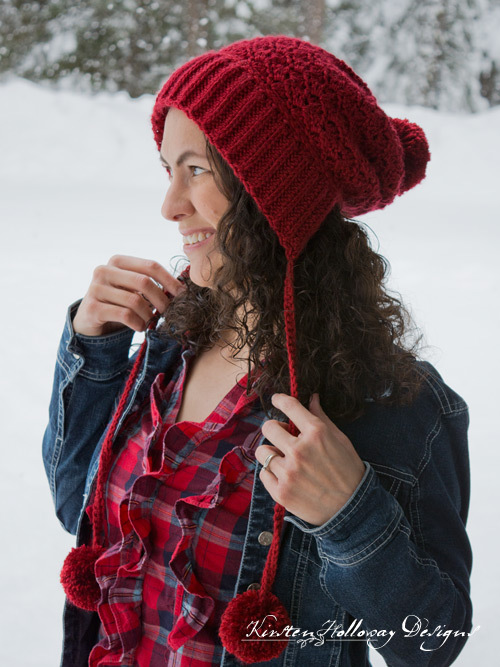 -Using a regular worsted weight yarn like Red Heart Super Saver or Vanna’s Choice will make this hat larger too. Note: Ribbing should measure 15″ long and 3″ high after row 44. Round 2: ch 1, sc in each of the next 7 , stitches 2 sc in the next *1 sc in each of the next 7 stitches, 2 sc in the next* Join with sl st to first sc (72) Note: Each hdc should get 1 sc worked into the side of the stitch when working around the brim. This next section is worked in joined rounds, however, you will be turning and working back the way you came after joining each round. Repeat round 4, 8 more times or until your hat measures 5″ tall from the top of the brim. Pull up a long loop from your sl st (about 6″). Cut, and pull the tail through the loop. Use this length of yarn to stitch around the opening, and pull it tight. Fasten off securely, and weave in ends. Using a larger hook, slip stitch very loosely around brim between rounds 1 and 2. Fasten off, and weave in ends. Attach yarn to the front edge of the brim. Ch 40, sc in second ch from hook and in each stitch. Fasten off. Attach securely to brim. Go to the other edge, and repeat the same steps. Using Clover “Large” pom-pom maker make one 3 3/8″ pom-pom, and two 2 1/2″ pom-poms. If you don’t have a pom-pom maker, make one large, and 2 medium sized pom-poms using whatever method you prefer. 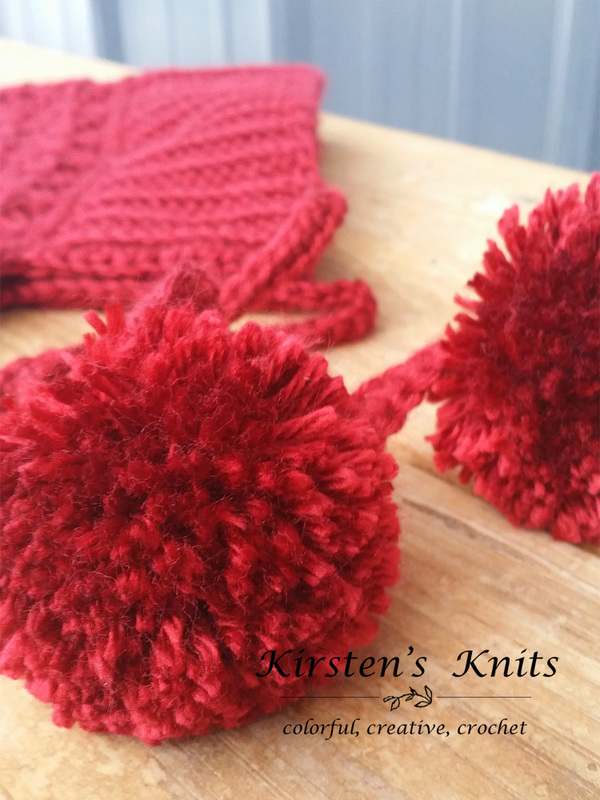 if you want to make faux fur pom-poms, find a simple picture tutorial at the bottom of this post here. Attach largest pom-pom securely to the top of the hat, and smaller pom-poms to the ends of the ties. Weave in all ends. Note: Ribbing should measure 18″ long and 3″ high after row 52. Attach yarn to the front edge of the brim. Ch 50, sc in second ch from hook and in each stitch. Attach securely to brim. Fasten off. Go to the other edge, and repeat the same steps.. Attach largest pom-pom securely to the top of the hat, and smaller pom-poms to the ends of the ties. 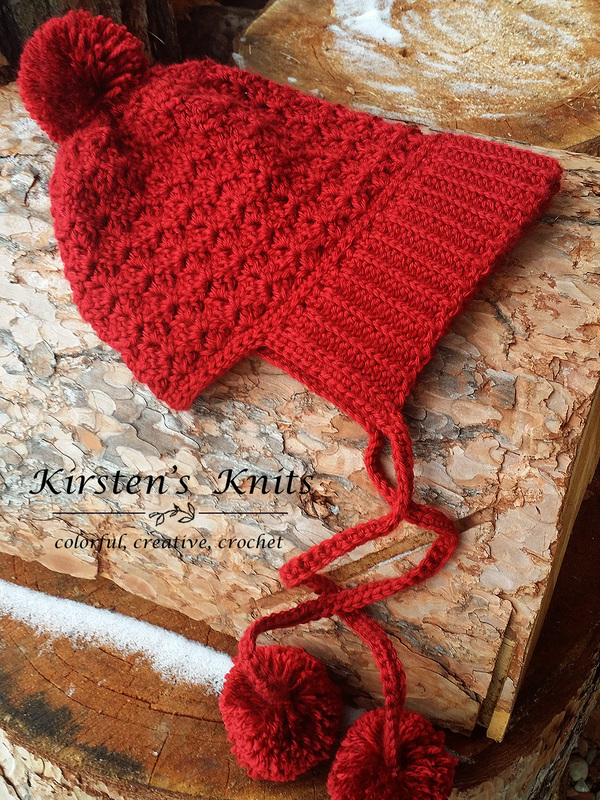 The Cranberry Twist Slouchy Bonnet pattern was made to be used by individuals, and small business crocheters alike. Selling your finished pieces in boutiques, at farmer’s markets, craft shows and other events is encouraged! The only thing I require is that it not be used commercially to produce millions of copies. Disclaimer: This post includes affiliate links. When you purchase something using these links a small amount of the sales price goes to me to help keep this site, and the patterns on it free. You do not pay any extra for the item you purchase. How cool is that?! This is super cute! I'll be making this soon! I'm glad you've enjoyed it so much! Looking forward to seeing your pictures on Ravelry! Yes, it should be 21 for the adult size. I’m not sure how the 24 got in there–Oops! I’m updating the pattern now. I just finished this hat and absolutely loved making it! Is there a scarf pattern using the same stitch as the body? Love the pattern. Trying now but have a question for the adult version…for the ribing pattern for rows 2 thru 52 then followung this privides measurements for after row 56? Did I miss rows? The yarn is ready, the hooks as well. Can’t wait to begin! I NEED one of these! Hats always slide up and off my pointy head! The ties should solve that nicely. Thank you! I have a question regarding sizing for a child. Approximately what size of child is the child size pattern for? What is the finished measurement for the child size? I would like to make one for a 12 -18 month size. Is that too small for your pattern? Is there a simple method for me to use to make it smaller? The child size would be for a 4-8 yr old. You could try using #3 lightweight yarn and the child instructions and see if that would work for a 12-18 month old. I’ve been looking for the perfect bonnet pattern to make for myself, and this is beautiful! Thank you, I’ll be starting on this one soon. For the life of me I can’t work out where to do the trim? is it the rows where the the pattern changes from the brim to hat?